Ancient Maya: Astronomers, Farmers ... And Salt Entrepreneurs? 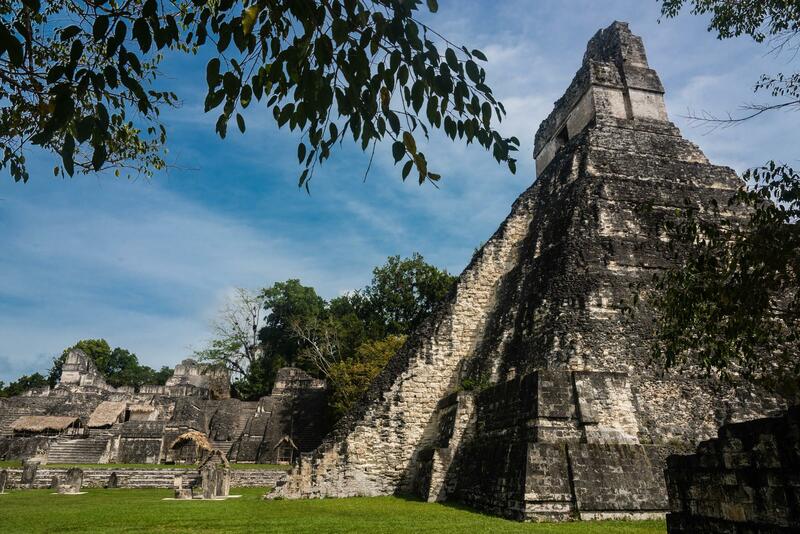 Ancient Maya ruins at Tikal in northern Guatemala, near the border with Belize. Researcher Heather McKillop explains that Maya sites like Tikal could have been popular marketplaces to trade salt and other commodities. The ancient Maya might be known for their mathematical aptitude, their accurate calendars, and their impressive temples. But did you know they were also salt entrepreneurs? During the peak of Maya civilization – from 300 to 900 A.D. — coastal Maya produced salt by boiling brine in pots over fires. The end result was shaped into salt cakes, then paddled by canoe to inland cities and traded at extensive markets. The latest evidence supporting the existence of the Maya salt empire comes from Heather McKillop, an archaeologist at Louisiana State University, and her co-author, anthropologist Kazuo Aoyama from Ibaraki University in Japan, an expert on stone tools. Their research, published Monday in the Proceedings of the National Academy of Sciences, reveals that not only were the Maya producing a lot of salt, they were also salting and preserving fish, which they were able to contribute to the local economy. Salt and salted fish were both storable commodities, which means they were suitable for trade and also for alleviating potential food shortages, the researchers say. McKillop has been studying salt production sites in the Maya lowlands of Belize for almost 30 years. She's uncovered the remains of 110 salt-producing kitchens in the region – each one of which could have produced enough salt for 7,000 people per day, she says. (Though it's unlikely they were all in use at the same time). "I thought the findings would be that they cut a lot of wood, but in fact, the majority of the stone tools were used for cutting meat and fish. That really changed out views," McKillop says. In other words, Maya were not just producing a lot of salt, they realized; they were also using salt to produce dietary-necessary commodities. This meant the salt-producing Maya played an important role in the greater Maya civilization – which at its height is believed to have encompassed millions of people throughout Mesoamerica. "Our research gives clear evidence that the coastal Maya were an integral part of the Mayan economy because they produced and traded a basic commodity, salt. Since everybody needed salt, the coastal Maya really contributed to daily life," McKillop says. Salt is a biological necessity. Sometimes we have too much, yes, but salt has been an essential to human life since the dawn of civilization. In the ancient Roman and Chinese civilizations, for example, salt was also vital for food storage and trade, says Harvard University archaeologist Rowan Flad. "Salt's importance extends beyond regulating osmosis," Flad says. He says the mineral holds great importance to the foundations of many societies. By enhancing certain flavors and tastes, for example, salt makes cuisine more versatile, and allows foods to be tied to specific places, Flad says. Flad, who has studied the importance of salt during the dynastic period in China, says its actually pretty difficult to identify the ways salt was made, and where, because salt itself does not stay preserved. "It's always kind of a fascinating puzzle," Flad says. McKillop has been putting together the pieces of the Maya salt production puzzle for years, but she's not done yet. In the coming years, she will conduct more research by her site in Belize's Payne's Creek National Park to uncover the true extent of the salt production infrastructure.